I step out of the noise of the Bayfront on a tourist-crowded summer afternoon into what looks like a greenhouse. Pink, and purple poseys and bright yellow sunflowers bloom on shelves, their perfume blending with the scent of wet soil. Signs urge visitors to step carefully on the fake-lawn carpet. As I watch, something moves past me: a butterfly. The closer I look, the more I see. Butterflies sit on flower petals, dot the ceiling and windows, and rest on the floor, their wings moving slowly. This is Butterfly Adventures, a temporary exhibit in Mariner Square in Newport, Oregon. The brainchild of former residents Peter and Lisa Noah, the exhibit gives visitors a chance to see free-flying butterflies up close. The beautiful insects may even light on one’s hair or hands if one is lucky. Signs around the room offer interesting facts about the different types of butterflies and their life cycle from caterpiller to butterfly. Did you know that butterflies taste with their feet? 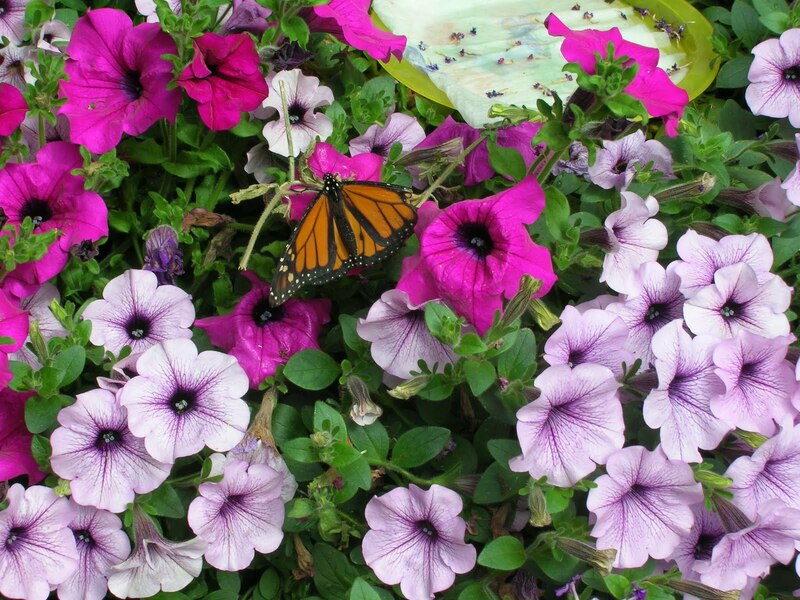 Most of the butterflies here are Monarchs, big orange and black beauties that tend to gather in the sunniest spots. A few have bent wings, damaged by some mishap. Their lives are short and could be shortened in such a space. How easy it would be to step on an unseen butterfly. I saw a little girl do just that. It’s a risk operating such an exhibit, which is probably why it will only be open through the end of August. But it is sweet to sit with a butterfly for a while, closely studying each other. Butterfly Adventures is open from 9 a.m. to 8 p.m. Tickets, available in the Mariner Square gift shop, are $5 for adults, $3 for children 3 to 11 years old. Photos are encouraged. 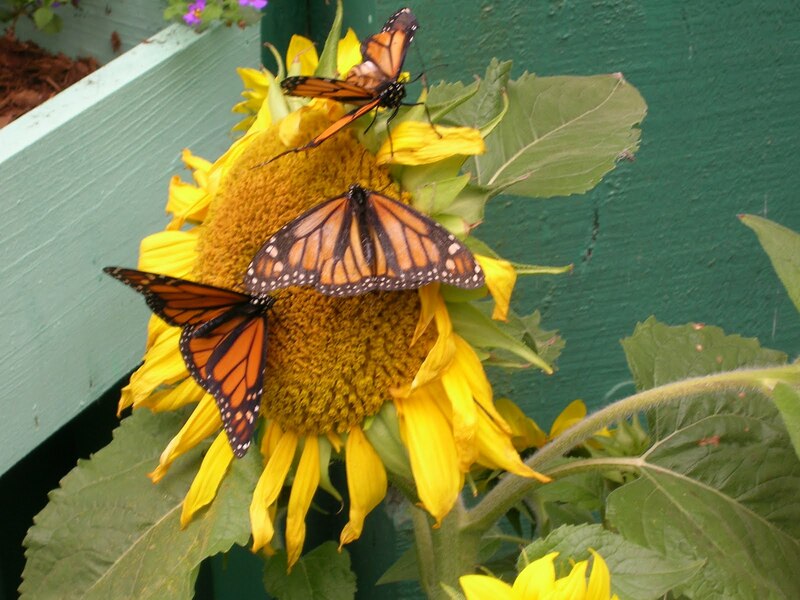 For more information, visit the Butterfly Adventures web site or the Monarch butterfly site.